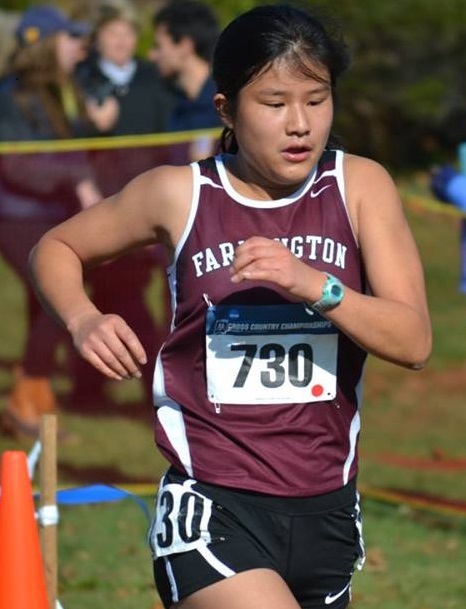 WATERFORD, CT- Windham’s Gwen Baker finished third for University of Maine-Farmington on 14 November. Connecticut College hosted the men’s and women’s NCAA Division III New England Region Cross Country Championships Saturday. Fifty-five men’s teams faced off for the 8K and 56 schools entered their women’s teams in the 6K. Nearly 400 runners started each contest. The UMF men placed 32nd improving thirteen places over 2014 according to TFRRS.org, the US Track & Field and XC Coaches Association website. The women at 38th climbed four spots. Robert Hollis finished 85th lowering his PR by 17 seconds. Four of the top five men ran their best times of the season. The top three finishers in the women’s race improved personal performances. Laura Pulito finished first for UMF in 186th improving her average mile time by five seconds. The second scorer, Emma Pidden, improved her average mile as did third scorer, Baker. The freshman’s average mile dropped an impressive 14 seconds. Baker said focus, using pack running for pace and wind deflection and believing in herself were the keys to her success. First year coach Scott Hutchinson was pleased with his team’s performance. He had a “great group of kids who bought into the program… and achieved PRs all season.” He said, “They turned some heads at the NCAAs.” Hutchinson said the future is bright; he will lose no women from the top twelve to graduation and only two of his top seven men are seniors. 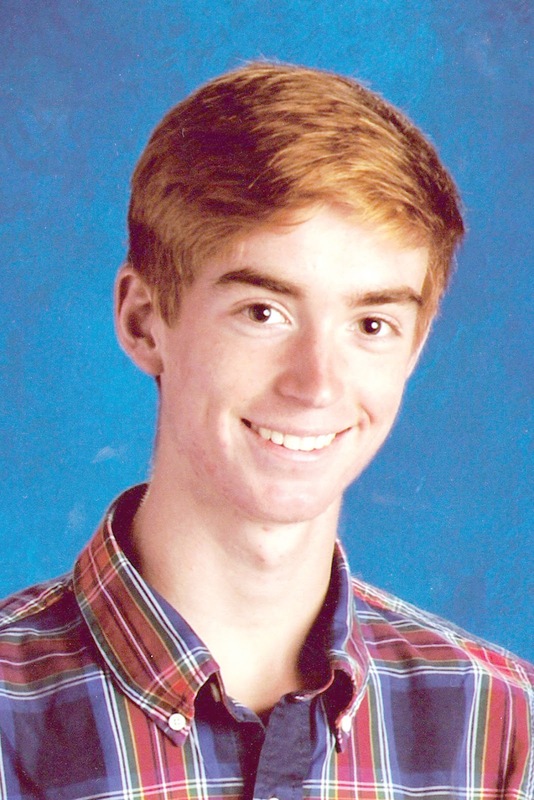 The Aroma Joe’s athlete of the week is Windham High School junior Ben Breton. The 16-year-old is the son of Jennifer and Nelson Breton. His sister is Danielle Breton. Ben has been on the swim, outdoor track teams and more recently the cross country team. “He is also a successful student and is a great model of what a Windham student-athlete looks like. Ben, a member of The National Honor Society, French Honor Society, Leo Club, Be The Influence Coalition, and the Outing Club, is a deserving candidate for athlete of the week. “This Fall Ben helped our XC team experience a 10-1 season, earn a third place team finish at their Regional XC Championship race, and an impressive fourth place team finish in the 2015 State of Maine Class A XC meet. 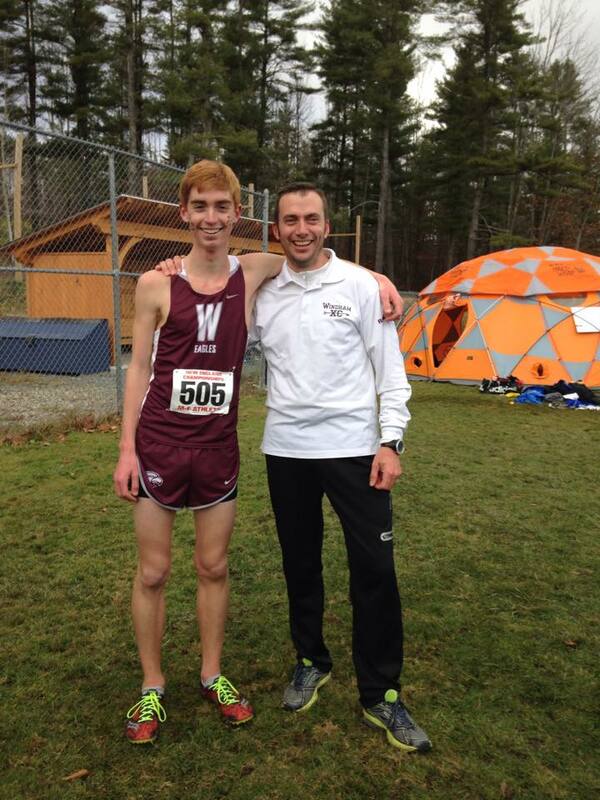 Ben led the boys team back to this years State meet, extending their season and continuing the expectation at WHSXC, to earn a team starting box in the Big Dance; a goal the Windham Eagles Boys XC Team has been sustaining now for eight years in a row. 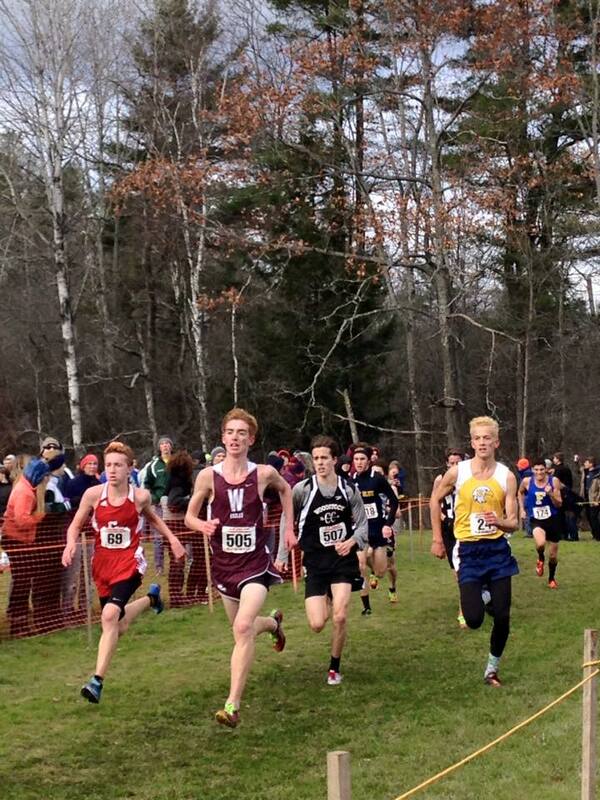 In the Maine State XC Meet Ben ran his assignment perfectly, as designed, as did his teammates. Due to his well-timed success, Ben earned the honor as a SMAA First Team All-Conference Runner. At the Windham Fall Sports Banquet last Thursday, he also received the 'Passion to Run' Award by his coach Jeff Riddle. 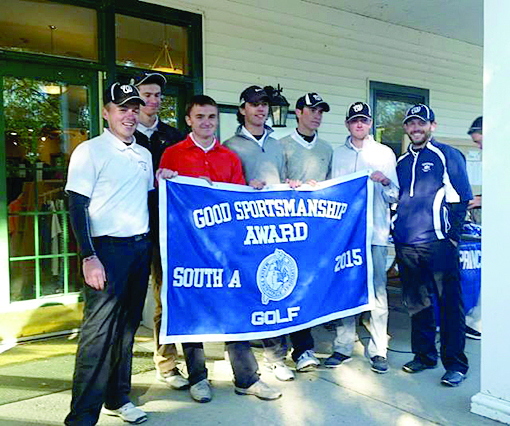 He and his team, actually both the boys and girls teams, were also recognized with the SMAA South Class A Sportsmanship Award Banners, which Ben played a large part in earning along with all of his amazing and classy teammates,” said coach Jeff Riddle. “In the State XC Meet Ben ran a stellar race to finish ninth overall in the meet against an impressive field of runners. This finishing position earned Ben the opportunity to race in the 2015 XC New England Championship Race, which took place on November 14th, at Thetford Academy, VT. This is a well-respected, hilly, no, mountainous, XC course, one of which he raced on earlier this season. Ben works very hard to find success in the classroom. Ben performs well in the many arenas available to him at Windham High School. He does this due to his stellar work ethic, fun personality, internal drive, and his passion to succeed/run,” Riddle said. Ben’s hobbies are running, hiking, biking and hanging out with friends. “When I first started high school, balancing sports and school was a difficult task, but it became much easier to balance them once I fell into a routine and figured out how to study correctly,” he said. Ben plans to go to college and most likely he will run, but his academics are his first priority, he said. 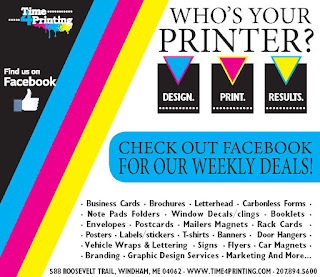 The Portland-Windham showdown was mentioned to be one of the matchups that could go to the wire. Number two Windham (7-2) played number one Portland (9-0) at Fitzpatrick stadium last Friday night. Portland edged out Windham 10-3 on September 18th during the regular season play when Bull Dogs Dylan Bolduc’s ran a 97-yard interception return with less than a second remaining in the first half which gave the Bulldogs a 7-3 lead. The Bulldogs added a 41-yard John Williams field goal in the third quarter. Windham played in the regional final for a second straight year, which is noteworthy considering the Eagles’ rash of injuries this fall. The rematch was predicted to be another defensive battle or the offenses would prevail. Anything can happen when these teams play one another. Windham lost Dylan Koza, a running back/defensive back, for the season with a knee injury in the first game. Eric Webb, a wide receiver/defensive back, was lost at the end of the last Portland game. The Eagles have had other injuries but some of those players have returned to play. Portland is led by Joe Esposito and George Chaison-Lapine, and Kyle Houser and Griffin Jacobson have been Windham’s top runners. “It should be a good physical matchup,” said Windham coach Matt Perkins. As Windham and Portland fans packed the stands on a very chilly night to watch which team would walk away the victors, the players themselves warmed up on the field. Some of them realizing this could be their last high school game as they will be graduating in the spring, while others on the sidelines wished they could be in the game. The Bulldogs took a 3-0 lead late in the first quarter. But an interception by Kyle Houser, followed by a 23-yard run and three plays later, Cameron Hoffses scored Windham’s only touchdown. The game then came down to one big play – an 80-yard run by Portland’s Joe Esposito halfway into the second quarter. The same scenario that happened during the regular season game; one big play – changed the momentum of the game. Portland led 10-7 at halftime, then scored on its first drive during the second half of game making the score 17-7. Field position and a tough defense kept Portland in control the rest of the game. The Eagles may have ended their season, but what a season it ended up being. Windham High School hosted Cheverus High in the Class A North semifinal football game last Friday night. It was an unusually warm evening for November and the fans for both teams took advantage of that and packed the stands. As Windham was looking for a fourth win in a row against Cheverus and a win to move on in the playoffs, Cheverus was looking for a win, revenge and a chance to break their losing streak with the Eagles. The Eagles came out strong; however, after a couple of nice drives down field the ball was fumbled and lost two times turning the ball over to the Stags. The Stags neglected to take advantage of these misplays and gave the Eagles the opportunity to continue their powerhouse drives. Windham dominated with their line and the game was a one-sided show for the most part. Windham totaled 59 plays for 381 yards – 356 on the ground while Cheverus only gained 74 yards on 38 plays. Senior Griffin Jacobson rushed for 123 yards on 17 carries. Cameron Hoffses gained 115 yards on 17 carries and Kyle Houser added 62 yards on 11 carries, while quarterback Desmond Leslie took off for 41 yards of his own. Windham was dominating, but the score was still 0-0 after the first quarter, then Cheverus made a major error with its one turnover of the game. A pass from Cheverus quarterback was deflected and sophomore Tanner Bernier grabbed the interception at the Stags 23-yard line. Windham ended up scoring five plays later on Kyle Houser’s 4-yard run. Senior Robert Inniss made his first of four extra points this game. Windham’s line of Luke Forbush, Dederick Eastup, Tyrell Gullatt, Gerry Valliere and Thomas Sappier were strong all night and the Stags felt it. The Eagles scored on their final drive of the first half, going 66 yards in 3 minutes, topped off by Leslie’s 9-yard run, for a 14-0 halftime lead against Cheverus. This lead was just what the Eagles needed going into the second half of the game. The Eagles dominated the second half of the game. While Cameron Hoffses and Kyle Houser scored in the second half bringing the score up 28-0, the Eagles defense was outstanding with Gullatt, Valliere and Sappier plugging up the middle. Both ends of Kyle Kilfoil and Griffin Jacobson, and linebacker Patrick Leavitt contained the outsized the Cheverus Stags offense. Second-seeded Windham (7-2) advances to the North championship game next weekend against top-ranked Portland (9-0). Windham is going for a second straight regional title. The Eagles have to avenge a 10-3 loss against the Bulldogs from earlier this year. “Looking forward to it,” Perkins said. The No. 3 Stags finished at 6-4. It is the first time since 2008 that Cheverus has not reached the regional final. The Eagles next game is Friday night at Fitzpatrick Stadium against Portland at 7 p.m.
Windham High School fall sports teams have enjoyed a lot of success this year so far. Most teams have experienced a state tournament or playoffs. Even more impressive than the winning records of the teams, and postseason play, are the awards they are racking up in recognition of their efforts. 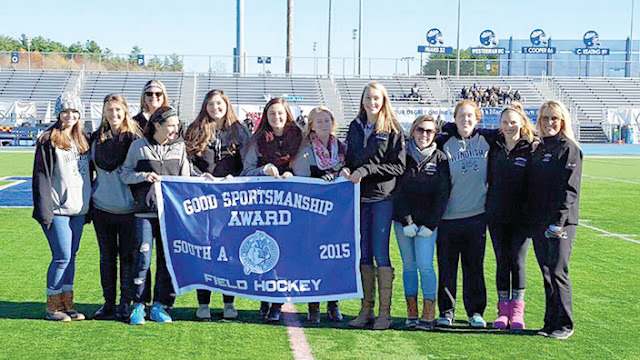 Five Eagle teams have won Maine Principal's Association (MPA) Sportsmanship banners. An incredible number for one school, in one season. “MPA sportsmanship banners are something that I take very seriously. It's a reflection of that particular team, our school and communities. We want to have competitive teams and are enjoying much success, but handling ourselves in a classy and appropriate manner is an expectation of all adults and athletes,” said Windham’s athletic director Rich Drummond, who couldn’t be more proud of the teams and coaches. Each school casts sportsmanship votes to the MPA for their first, second and third choice schools. 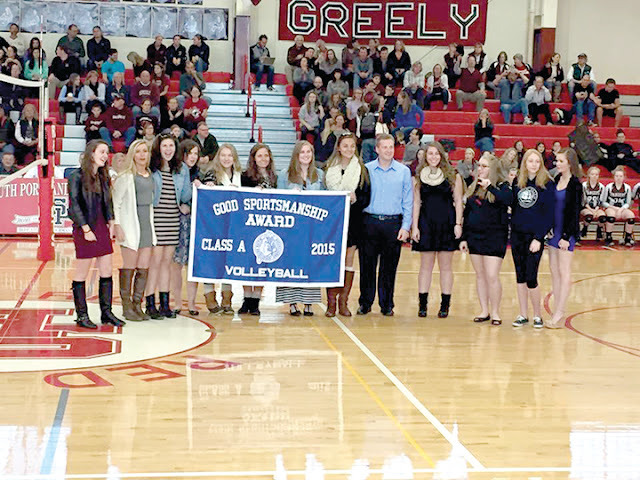 These votes help to determine who is chosen as the winner of the sportsmanship banner in that given sport. 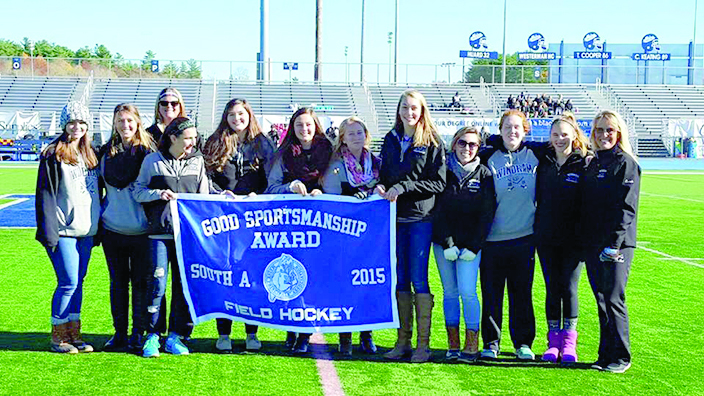 This year sportsmanship winners from Windham are: Girls and boys cross country under the direction of Jeff Riddle, field hockey coached by Melissa Dubois, Volleyball coached by Chris Cloutier, and the Golf team coached by Adam Manzo. "To win one banner in any school year is an accomplishment, but to win five in one season is unheard of. It's a true reflection of our coaches, kids and families," Drummond said.